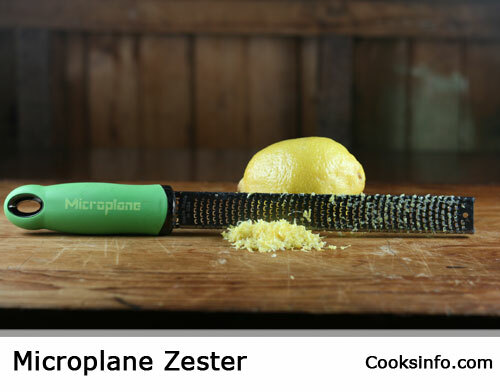 A Microplane® zester is a brandname of citrus zester. 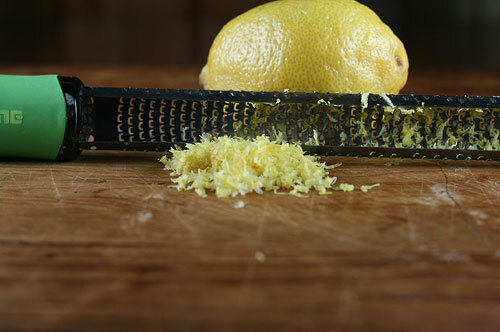 Many people swear by it for making lemon or orange zest with, as it makes fluffy shreds of zest very fast. The tool looks almost like a woodworking rasp, with a large handle and a very long zesting blade made from stainless steel. They come with a plastic protective casing to keep the metal rasp part in. It can also be used for shaving parmesan cheese, chocolate, ginger, ice, etc. Fans of speciality salts, some of which come in chunks, use their Microplane to “freshly grate” their salt right at the table. A Microplane can’t, ironically enough, produce strips of zest. When you want long strands of more solid zest for a garnish effect, you need a regular citrus zester. To use on a citrus, just lightly press the end nearest the handle down on the skin of the fruit, and pull it along the surface of the fruit. Make several passes to get an inch or two of the fruit’s surface at a time. Do not press down too hard, or you will get the white, bitter pith underneath the zest, which you don’t want. Which direction you pull in will depend if you are right or left handed. To clean, pass under running water, and put in top rack of dishwasher (or finish cleaning by hand.) Any fine shreds remaining in the teeth can usually just be easily brushed out with a kitchen brush once dry.